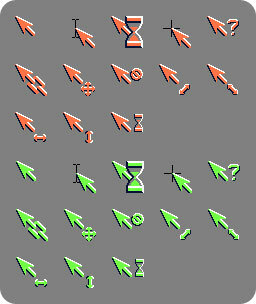 I have made a set of cursors based on one Amiga cursor (can’t find my reference image right now…) that I use on all my Windows machines (which, ehem, is all I got right now). The cursors are orange with a white highlight and black shadow, making them visible in as good as any environment. Here I also included a green version, which might be preferred by some. Based on my personal preference, I have included the actual arrow in all cursors. This because I want to know where my cursor is, and where it will click, independent of what it is trying to communicate. As an example the cursor transforms into something completely different when handling text, a color-inverting thin beam, but in this set the beam has an arrow attached to it. This is why I have designed them this way. Oh, and the cursor I use instead of the hand is the link cursor, which has a link and a half attached to it, the beginning of a chain. This entry was posted in Creative and tagged Amiga, Cursors, Download, Windows. Bookmark the permalink. It’s nice to hear you find them useful, Guy :D Thanks!